small amount of worsted weight yarn for bodyand either a baby weight yarn for eyes or split and usehalf of 4 ply and use that for eyes. The body is worked in the round without joining. I hide the beginning end of the yarn as I crochet . Row 1; 6 single crochet in second chain from hook. Row 3 & 4; single crochet around. At this time make eyes between round 3 & 4. Rows 5 &amp; 6; single crochet. For squid, cut and make fringe around the bottom, including the ending yarn of the body. 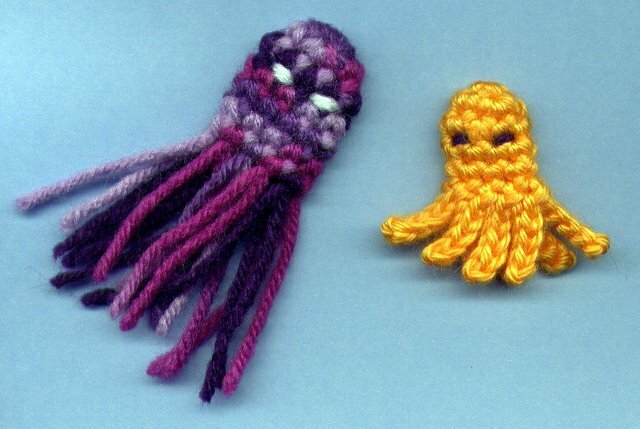 For octopus, *slip stitch in next single crochet, chain 6, slip stitch in second chain from hook and next 4 chains. Repeat around for 8 "arms". There will be 1 extra stitch at the end, slip stitch into it and end off. Hide yarn ends where needed.